Duo Country US comprenant James Carson (né James William Roberts, le 10 Février 1918) et Martha Carson (née Irene Amburgey, le 19 Mars 1921 à Neon (Kentucky), décédée le 16 Décembre 2004 à Nashville (Tennessee). Martha était la soeur de Jean Chapel. 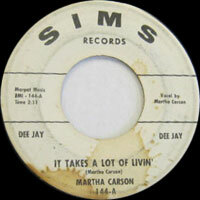 During the 1950s, Martha Carson's rock & roll-flavored gospel tunes had a strong influence on her country peers, most notably Elvis Presley. She was also one of the first country artists to deliberately seek and find popularity on the pop charts. 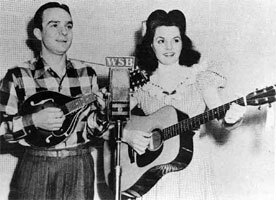 Carson was born Irene Amburgey in Neon, KY. She and her two sisters were spotted by radio barn-dance impresario John Lair and invited to join the cast of the WSB Barn Dance in Atlanta in 1938. 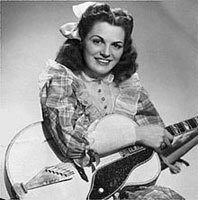 The Amburgey sisters were given the fanciful hayseed names of Minnie, Marthie, and Mattie, and after Irene Amburgey left the group and teamed with her husband, mandolin player James Carson, in the 40s, the stage name stuck and she became Martha Carson. The duo performed (with Martha on guitar) as the Barn Dance Sweethearts. By the time of their divorce in 1950, Martha had begun making solo appearances on Knoxville's WNOX radio. Unfortunately, she couldn't record because the Barn Dance Sweethearts' label, Capitol, had them contracted through 1957 and refused to let her go solo, instead trying to pair her up with other male singers. She began doing session work instead, appearing on the Carlisles' "Too Old to Cut the Mustard" and other recordings by that group of unrelated performers headed by WNOX stalwart Bill Carlisle.Things began to change after Carson met Fred Rose in Nashville. He helped convince Capitol to let her record alone, and in 1951 she made her solo-single debut with "Satisfied," a gospel song she had written in response to audience disapproval over her divorce. The combination of Carson's powerful alto voice and the song's propulsive handclap backbeat formed one of the blocks on which early rock & roll was built. The song featured backup by Carlisle, Chet Atkins, and Carson's sister, Opal, now known as Jean Chapel; it was, curiously, not a hit in its initial incarnation, but it gained momentum continuously over the next several years. By 1954, Carson had recorded more than 24 songs, become a member of the Grand Ole Opry, and done extensive tours with such stars as Jimmy Dickens, Ferlin Husky, and rising star Elvis Presley. After their performances, she and Presley sang gospel duos, and he later claimed that she had more influence on his stage style than anyone else.Around 1954, Carson married Xavier Cosse, a pop promoter who had tried to learn more about the burgeoning phenomenon of country and gospel music by working with Hank Williams and Chet Atkins in Nashville. 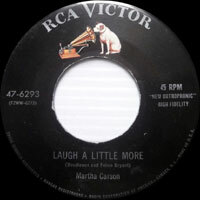 Carson seemed to be exactly what he was looking for, and he persuaded RCA producer Steve Sholes to sign her to that label and to whisk her off to Hollywood for a recording session. 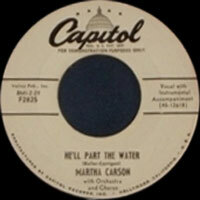 By 1955, Carson was living and recording all her work in New York. She had a series of minor hits that included "Journey to the Sky," "This Ole House," and "Saints and Chariot," a combination of two old favorites that Presley later covered in concert. After signing with the William Morris agency in 1957, Carson and Cosse became full-time residents of New York, and she gained national exposure by appearing on The Steve Allen Show. She moved temporarily away from gospel-oriented music and toward citified country-pop, appearing on Tennessee Ernie Ford's television program and pursuing a style shaped in part by his big, low Vocalss and pop orchestral arrangements. It was a successful move for a time, but by the late '50s, her star began to wane. She continued periodically recording on labels such as Decca, Cadence, and Sims, but although she was a fixture of live venues in Las Vegas and in California for a time, chart success eluded her. Her rockabilly roots showed in a series of performances she gave on the riotous Los Angeles country television show Town Hall Party in the late '50s. By the 1980s, she was living in semi-retirement.